It is hard to put the most magical place you have ever had the privilege of visiting into words, yet here goes. Magnificent. Beautiful. Colossal. Vast. The grandeur and scale of this lost world is beyond comprehension. Twice the size of Australia. 14,000,000 sq km. You could fit the United Arab Emirates into Antarctica 168 times, New Zealand 52 times. From the tumultuous waters of the great southern ocean, past the furious fifties and shrieking sixties, rises this magical land – the highest continent on earth, which is covered in ice up to 1.9 km thick. It towers above the sea, majestic, with huge glaciers and sheer cliffs guarding its plateaued interior, these giant walls of ice slipping into the sea on occasion with a thunderous roar. It is the coldest, driest, yes driest, windiest continent on earth, and the highest in terms of average elevation. Antarctica is dynamic, always changing, the sea ice around it growing and shrinking with the seasons, glaciers calving, clouds moodily shrouding it then releasing its beauty to the sun at the whim of the wind. It is the most spectacular place I have ever laid eyes on. And then the eyes wander, to the sea in front of this great southern land, the mid range of a man or woman’s eyesight, to a sea covered in icebergs, like crystals, the most beautiful pieces of natural art alive. And then they wander to the near range of human eyesight, where smell and hearing are also useful allies, for in the near range, some of the largest beasts in our world, the mighty whales, gently glide, communicating through song, every once and a while diving into the depths to feed on krill, the shrimp like creature that is the nourishment and lifeblood of this lost world. There she blows. And another. And another. Families of whales, in relative abundance, all enjoying the summer riches of this kingdom of kingdoms. The biodiversity is like I have never seen. The whales, the seals – sleeping and barking and jostling for dominance, the penguins, those loveable creatures whose antics can’t help but make one smile. Never have I seen anything like it in my lifetime. Antarctica is magnificent. It’s biodiversity is like a portal to another world. In the unknown sphere, it has a mystical aura that is difficult to explain – yet you can sense it. On an ecocsystem nature-society level, it carries 90% of the world’s fresh water. Our Antarctica is fundamental to the human race’s survival. 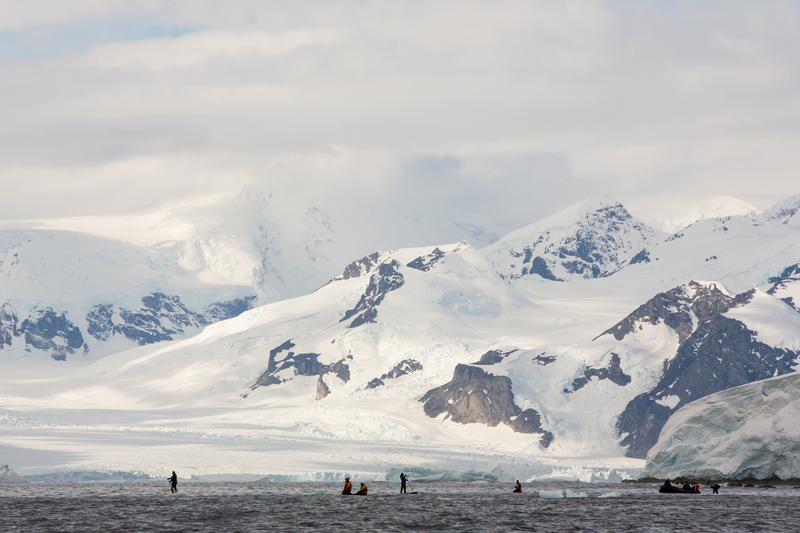 Paddle boarding in Antarctica. Day 1. 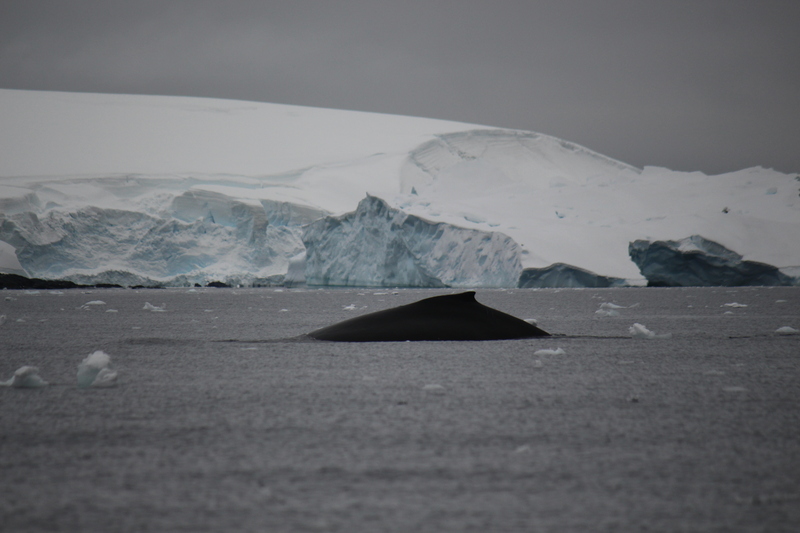 The whales are returning to Antarctica after being hunted to near extinction. The Mission. 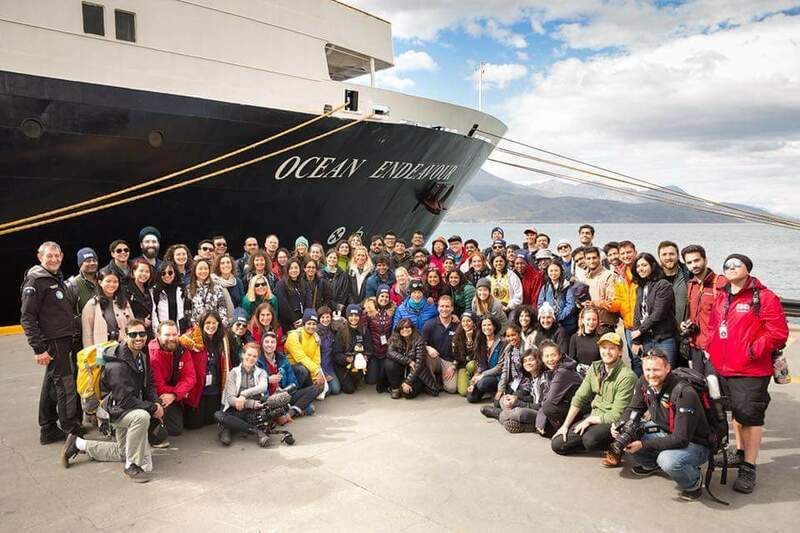 The ClimateForce International Antarctic Expedition 2018. 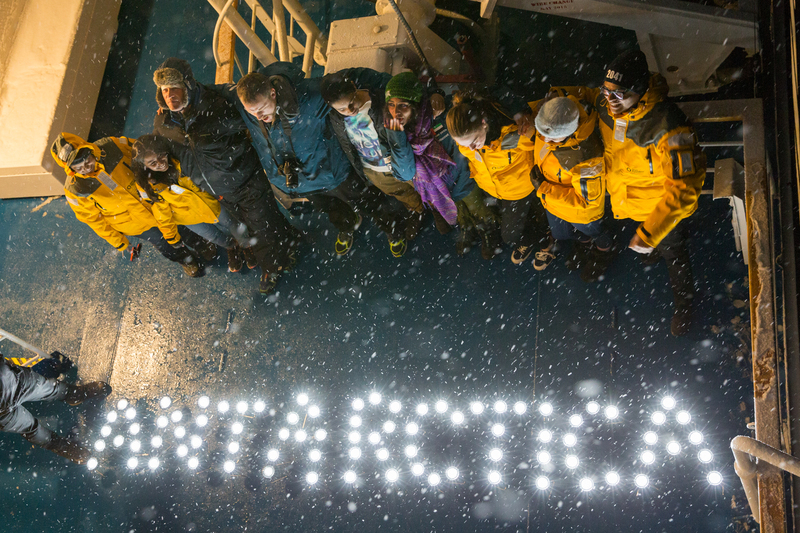 Ninety environmental ambassadors from over 20 countries took part in the two week expedition to Antarctica, the purpose of which was to learn about the continent and climate change through the Explorers Passage and polar explorer Sir Robert’s renowned ‘Leadership on the edge Programme,’ with each leader then charged with the responsibility to return to their respective countries to ignite the change to a low carbon economy. Sir Robert was the first explorer to walk to both the south and north poles and has since become a fierce environmental ambassador and advocate for the ongoing protection of Antarctica. In 30 years’ time, when the Antarctic Treaty and its environmental protocols are able to be reviewed – which preserves Antarctica for non-military use and scientific research, those that took part on the expedition will be charged with re-negotiating it for the greater good of nature and society. I personally pledged that in 30 years, at age 65, if lucky enough to still be here, that I would somehow be at the negotiating table. The word of the 90 2018 ambassadors is our bond. Never have I met such a talented and inspirational group of people in one place. Every single one of those 90 people from 20 countries. There were explorers, government officials, master film makers, scientists, rock stars, executives in business, entrepreneurs, authors, and youth. Every single person had an interesting story, had had challenges in their life, but had persisted on their path to work in a field of their passion, and overcome those challenges. And all were committed to working tirelessly in their respective countries and fields, to be change makers working toward a low carbon economy. Antarctica needs them. And we need it. A period of two weeks, with no internet, no cell phones, embedded in nature, with an incredible team; there really was something fundamental to the concept ‘disconnect from the world to reconnect.’ There was nothing better. Everyone getting out of their comfort zone and engaging with people – having a conversation – sharing challenges past, lessons learned, debating theory, getting insights, reflecting on it all, and making friends for life. Reflection. There was time for reflection and journal writing. And from those conversations, so much was learned about the world, about people, about motivations, about beliefs, about what we need to change as a society. One concept was ‘graduation of mindset’, where a person removes themselves from their day to day routine, immerses themselves in nature with like minded people, and broadens their horizons from the narrow to the broad. From the phone to the horizon. From the dream to the reality. From the ‘I’m not sure if I can’ to the ‘I will make that happen.’ And ‘I will do that,’ whilst sharing it with others, because the best things in life are shared. Open your eyes. Turn off your phone. Talk to the person next to you. You may be surprised to find that they have a lot to offer. Laughter and friendship even. 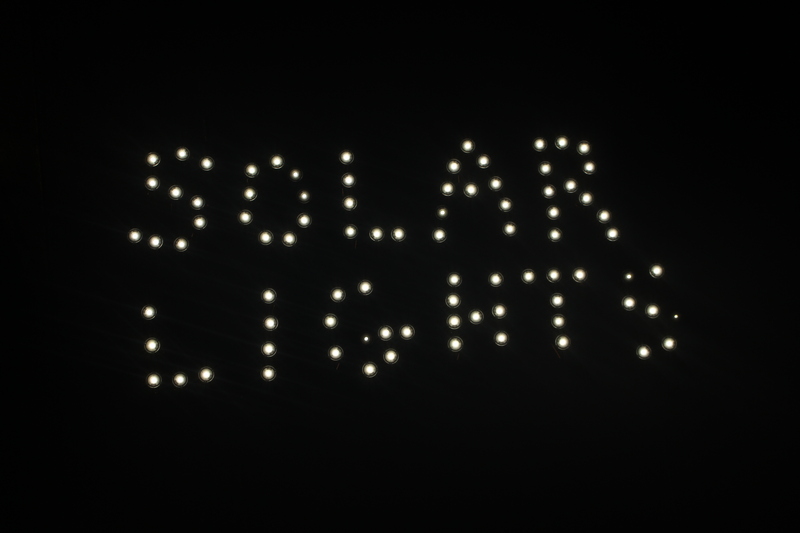 Team Zayed and the Solar Lights – Our message to the world. Team Zayed was a team of three representing the Environment Agency Abu Dhabi and Dr Jane Goodall’s Roots & Shoots, in honour of the late Sheikh Zayed bin Sultan Al Nahyan, the founding father of the UAE, in this 2018, a celebration of his life, the Year of Zayed. 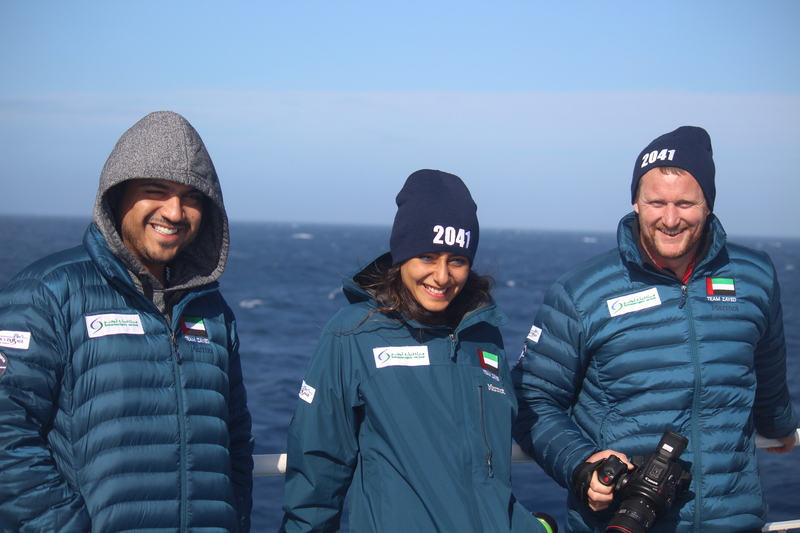 The team consisted of the Environment Agency’s communication’s specialist Mariam Al Qassimi; Scientist of Mammalogy, Rashed Al Zaabi; and myself, Winston Cowie. Team Zayed representing the Environment Agency Abu Dhabi. Left to Right. Rashed Al Zaabi. Mariam Al Qassimi. Winston Cowie. We were incredibly privileged to represent the agency and grateful to our inspirational Secretary General, Her Excellency Razan Khalifa Al Mubarak, for the opportunity to take on the challenge of bringing the stark reality of a global issue – climate change – the challenge of our time – back to the UAE for further discussion and debate. 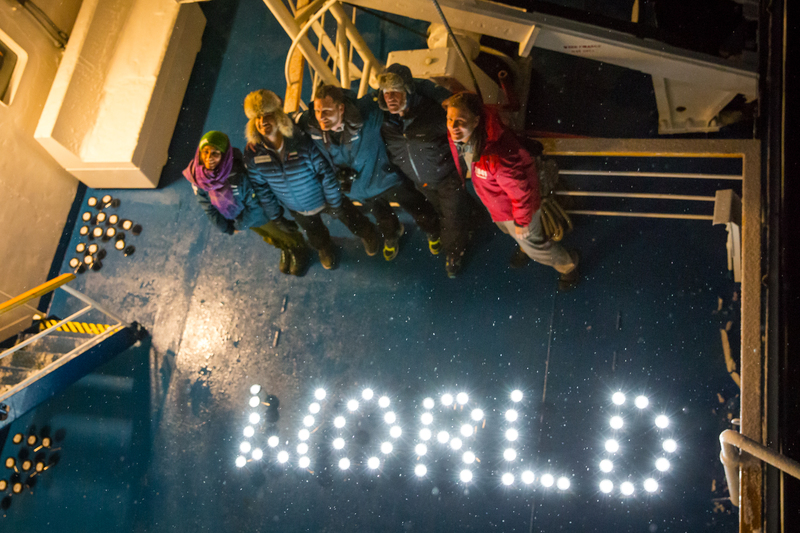 Whilst in Antarctica, Team Zayed led an initiative where with 102 solar lamps, with all delegates, we held a solar lights show, making words with the lights in the cold and dark of the Antarctic night, and sending them to the world. The launch of the Zayed Solar Lights Show. From the Ocean Endeavour. Antarctica. 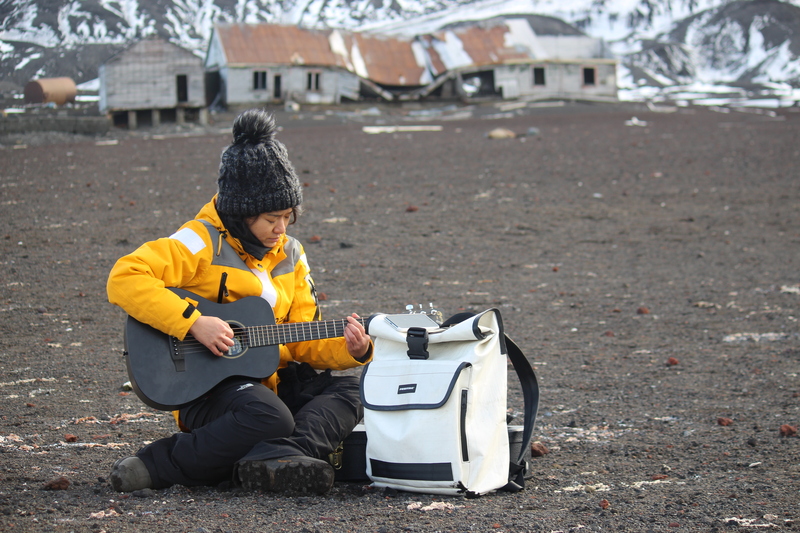 As we lit up the Antarctic night, one of our colleagues on the expedition, Inch Chua from Singapore, a talented musician, sang our message in the Antarctic night. We could hear whales surfacing as we sung, in union. It was one of those incredible unforgettable moments when time stood still. The full message to the world and UAE leadership will be released soon. 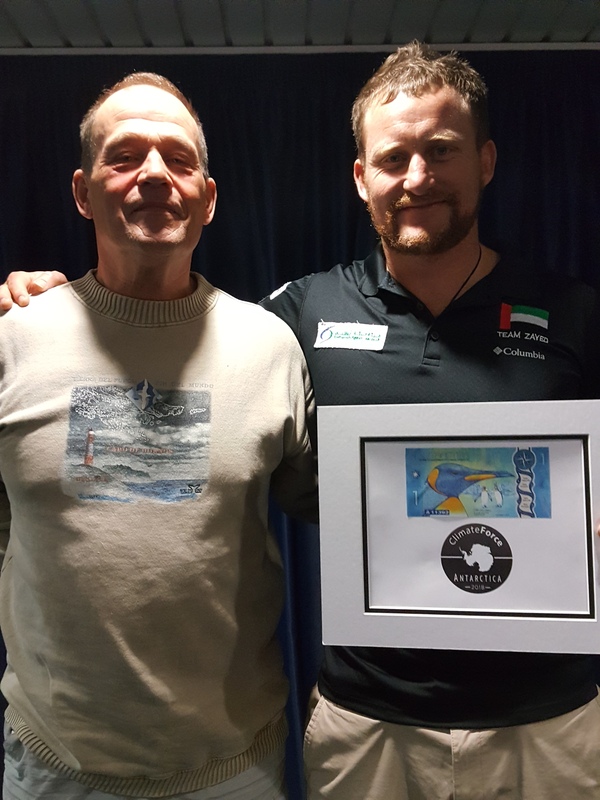 If we can send a message to the world from Antarctica using renewable energy, if Robert and his son Barney, a 23 year old champion, can walk to the South Pole using only renewable energy, we can transition towards a low carbon society. Please! Heed the words – on the individual level. Stop. Think. Act. Graduation of mindset. ‘Why’ is the question. Why are we doing what we are doing as a society? Do we really need that plastic bag that we will use once and throw away? Do we really need that straw? Do we really need to have that take away coffee twice a day and throw away both cups? Stop. Think. Act. Be an energiser or change maker in your peer group and community is the summary. As a society we have got too comfortable with using something once and throwing it away. It’s not ok any more. It wasn’t in our parent’s generations, so why is it in ours? 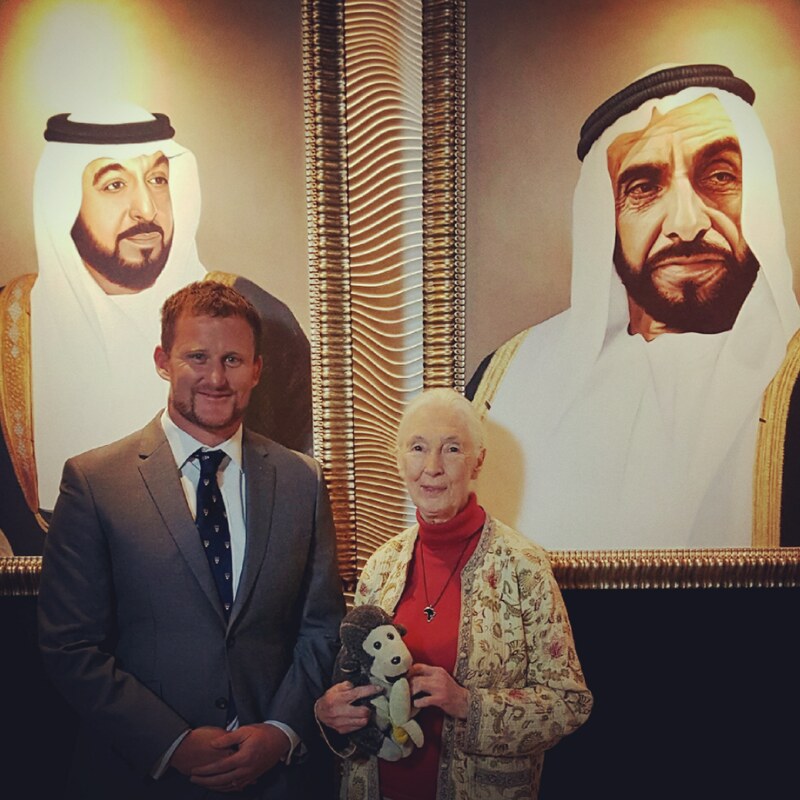 With the lights we also honoured our visionary UAE leadership, the Environment Agency, inspirational woman, service men and women and some global environmental heroes like Dr Jane Goodall, and Sir Rob and Barney Swan. It is important to say thank you. Two other names I would like to mention. What an amazing man he was – passionate, caring and determined. He really did inspire a new generation of environmental ambassadors globally and it is wonderful to see Teri and Bindi and Robert doing the same. 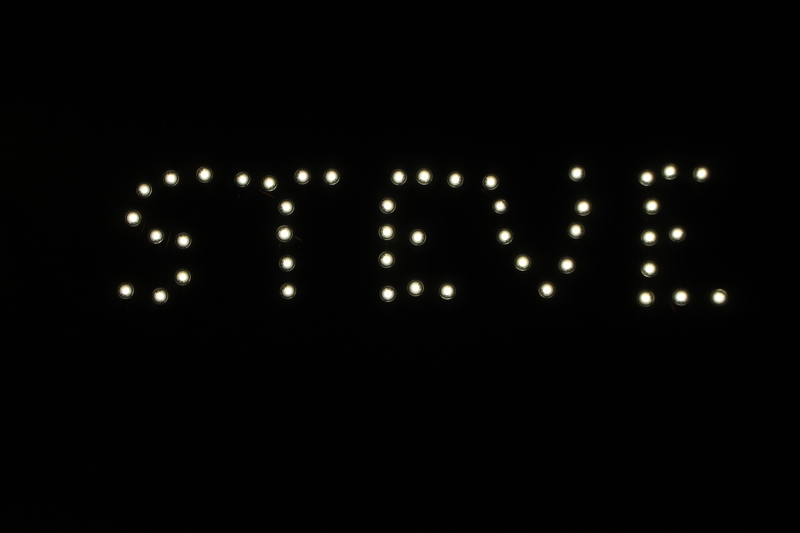 The agreement from those completing the solar lights show was unanimous – in honour of Steve and his family, we lit up the Antarctic night with the word Steve. The second name. Well it was before we headed back across the Drake Passage, the waterway that the late New Zealand yachtsman Sir Peter Blake had travelled around numerous times, that he was foremost in my thoughts. It may have been that I grew up a Kiwi kid, looking up to this role model who sailed the world’s oceans doing good things; it may have been the wandering Albatross that followed the Ocean Endeavour, it may have been his environmental legacy on his last voyage, the Seamaster, it may have been the way he passed too early, killed by pirates in the Amazon. 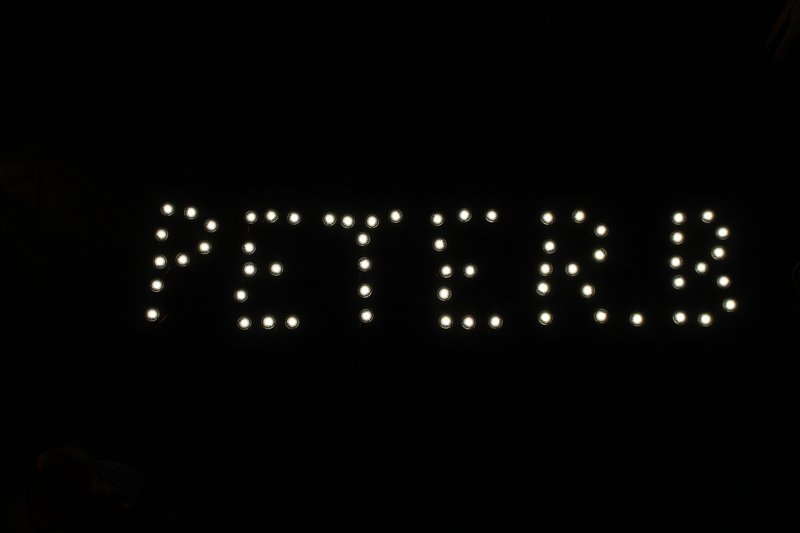 Regardless, the group on the deck of the Ocean Endeavour had a moment and wrote his name, in honour of all he achieved and for his family. They were quiet moments in the dark and cold of night, when we wrote those names. 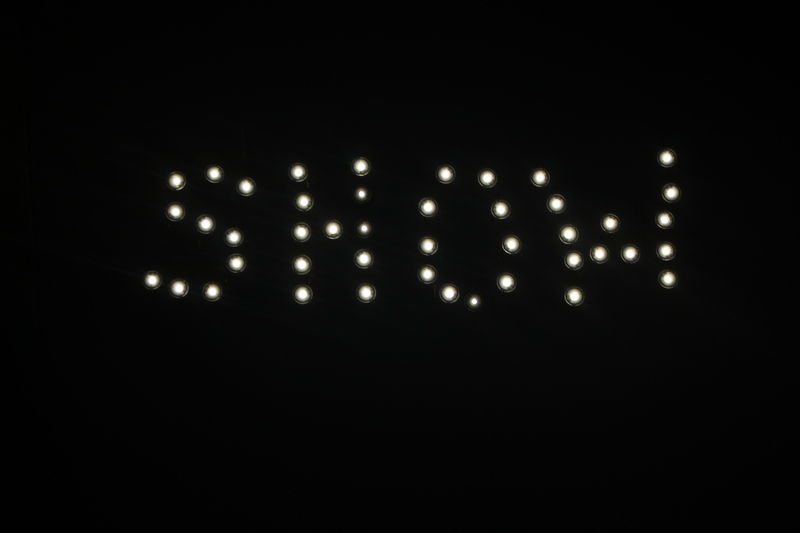 And all in solar lights. Lighting up the great southern ocean sky. Blinking in the wind and the spray of the waves. Looking to the past to inspire the present and the future. More on how Antarctica is being effected by global warming in another post – and what we as individuals and what countries can do to reverse the melt. It will be a huge challenge, but on leaving Antarctica, my overwhelming feeling was optimism. It really was and still is. I do feel optimistic for the future of Antarctica, optimistic because it is a place where we got things so wrong in the past – hunting whales nearly to the point of extinction, only for the global community to come together and protect them, and the Antarctic continent for science and peace. And they now live in that magical place, still recovering, but noticeably there. We can get it right with global warming and plastics too. I am sure. With good people and motivation. 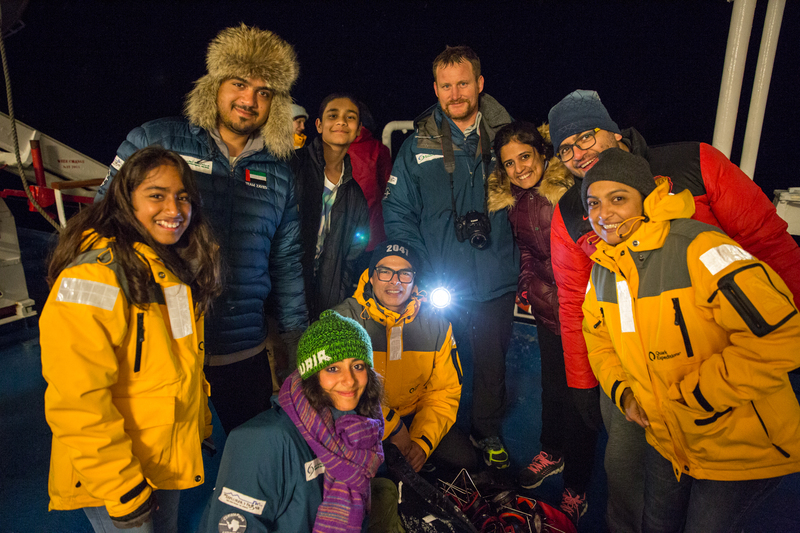 Each of the 90 persons on the expedition received a ‘Zayed Torch’ from the Environment Agency Abu Dhabi – one of the solar lamps that we used to send the message to the world with, from Antarctica. Each person, now friends for life, will go back to their respective countries and with their passion and energy, with their metaphorical Zayed light, make positive things happen for nature and society – rise to the environmental challenges of our time – plastics and global warming. For Team Zayed in Abu Dhabi we will be doing the same. Personally I think I had a graduation of mindset moment on the Ocean Endeavour in Antarctica. It was on the last evening as we rounded Cape Horn. 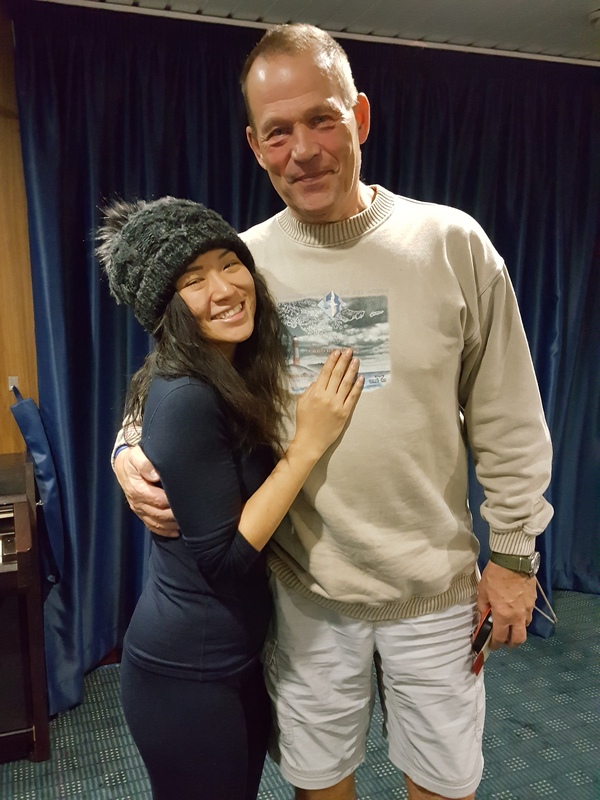 As we sat there and shared lovely moments with our new friends, and in Sir Robert’s final speech, with my new good friend and an inspiration, rock star Inch Chua from Singapore, we were awarded the Sir Robert Swan Leadership Inspiration Award for outstanding contributions to the expedition. It came as a surprise – an award from the legendary polar explorer. On reflection I was incredibly grateful and humbled but also motivated by it to deliver and make the candle burn bright. It is motivating and the Zayed and Sir Rob Swan torch will be burning bright, working hard, seeking positive outcomes, rest assured. Sir Rob Swan Leadership Inspiration Award. International Antarctic Expedition 2018. Winston Cowie. United Arab Emirates. 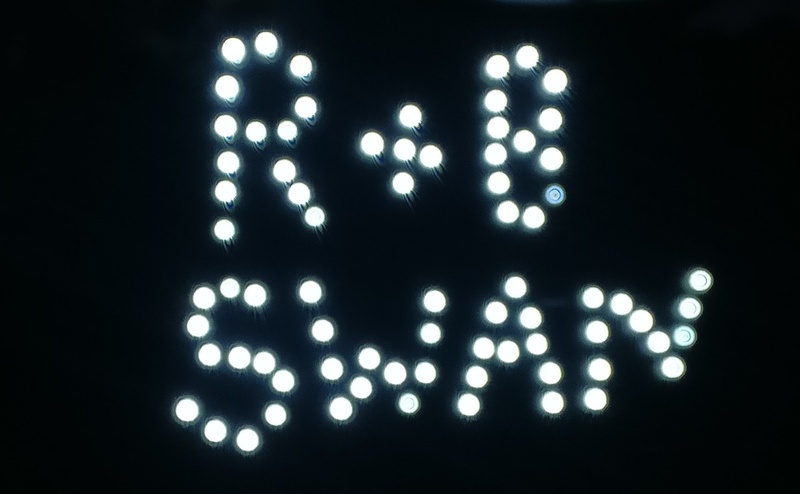 Sir Rob Swan Leadership Inspiration Award. Inch Chua. Singapore. Together we will. All of us. Including You. Because deep down you know what is right, that we need to change. That we can, with a little motivation. So You, reading this: Stop. Think. Act. Energise. Be the change. Climateforce. W J Cowie. Reflections on Antarctica. March 2018. 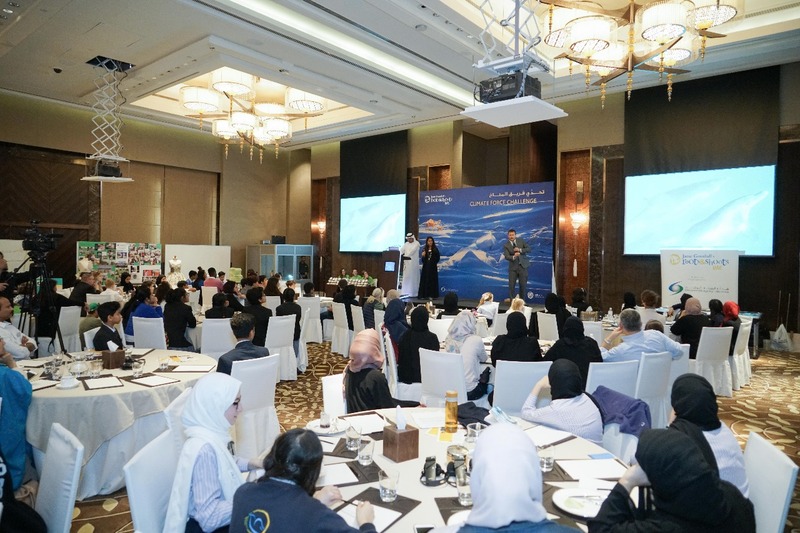 On Thursday the 25th of January 2018, the Environment Agency – Abu Dhabi (EAD) was privileged to host Dr Jane Goodall and 12 schools from around the United Arab Emirates (UAE) for the Jane Goodall Institute Roots & Shoots UAE Annual Awards. 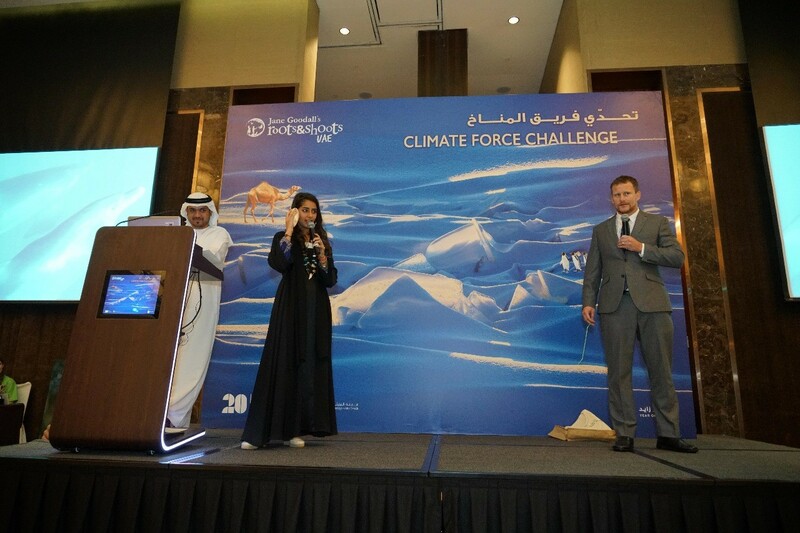 The awards doubled as the launch of the #ClimateForce Challenge, a collaboration between EAD, the Jane Goodall Institute, and polar explorer Sir Robert Swan’s ClimateForce 2041. Sir Robert Swan was the first person to walk to both the north and south poles. The challenge encourages everybody to consider their individual and everyday behaviours that impact the environment, and pledge to change their behaviour for the ‘greater good,’ with a collective target of reducing carbon emissions by 326 million tonnes by 2025! Thursday was the start of this journey, and it was fantastic to see that around 100 students, with Dr Jane Goodall and our three Ambassadors, make the ClimateForce pledge. Antarctica and being an energiser in the community on the environmental issues of our time calls! Plastics, inefficient resource use – we are coming for you! There is much more information to come – keep an eye on both the Environment Agency’s and Jane Goodall’s Roots & Shoots UAE website and social media – the planning has begun in earnest. Onwards and I am incredibly grateful to the Environment Agency – Abu Dhabi’s own inspirational leader, Her Excellency Razan Khalifa Al Mubarak for the opportunity to meet Dr Jane be involved in this incredible initiative. I couldn’t be more excited about the coming months. Twenty six days to go! Meeting Jane Goodall. It was incredible. 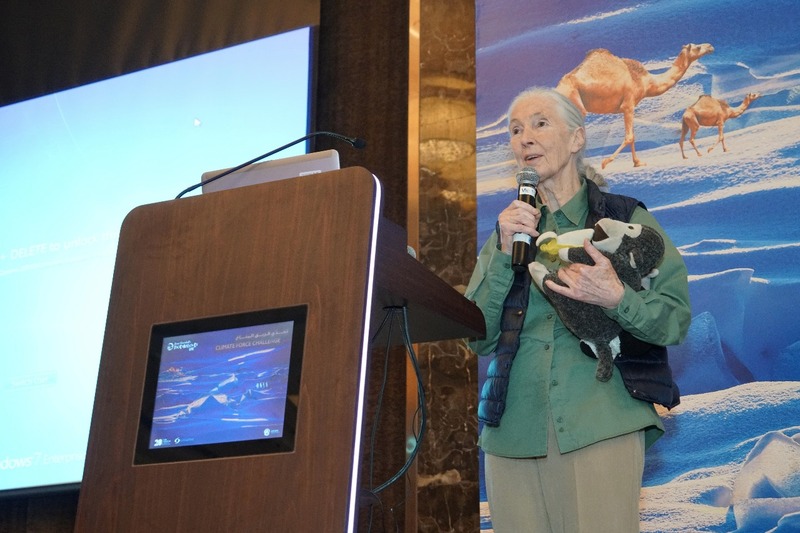 And on a personal note, so lovely and grateful to spend the last couple of days with Dr Jane Goodall as part of the Environment Agency – Abu Dhabi and Dr Jane Goodall’s Roots & Shoots partnership. She really is an inspiration – not only for her work with the chimpanzees in Tanzania, but for the institute she has set up – a grassroots conservation network which engages millions of youth and is in over 100 countries. At the annual UAE Roots & Shoots awards held Thursday in Abu Dhabi, as she spoke I sat there, looked around the room and considered what an amazing person she is – an energiser who gets things done – of the earth – inspiring youth (and adults as well to be honest), all over the world. At 83 years of age, she travels over 300 days a year (her calendar is booked 3 years in advance), talking, giving interviews, encouraging people to change their behaviour and live their values. We need people like Jane, and having had a treasured opportunity to meet with her, and have our wee girls meet her, I’m feeling seriously motivated (as they are from the conversation on the drive home) to make some changes to everyday consumerism and energy use behaviours. The ClimateForce challenge has well and truly begun. 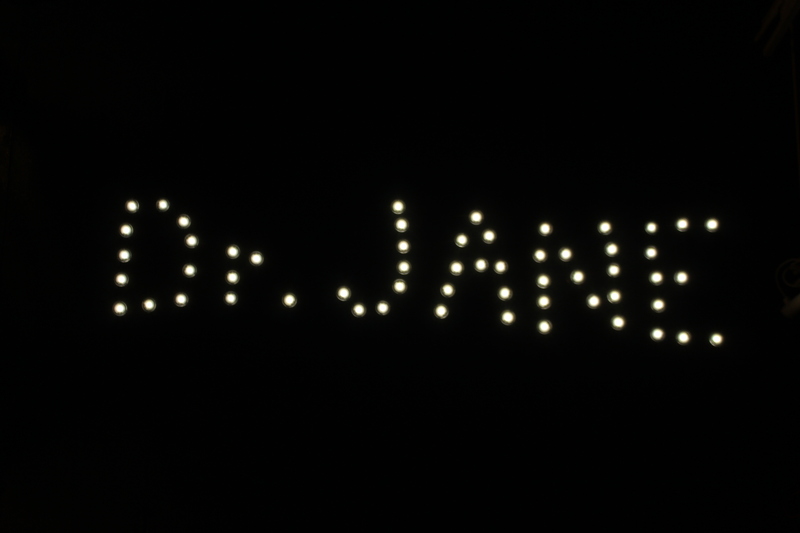 So thank you Dr Jane, your magic has worked. Check out her movie JANE which is out in some countries and will soon be out in others like the UAE. Can’t wait to see it! And once again, so incredibly grateful to the Environment Agency – Abu Dhabi for the opportunity to be a part of this wonderful initiative.